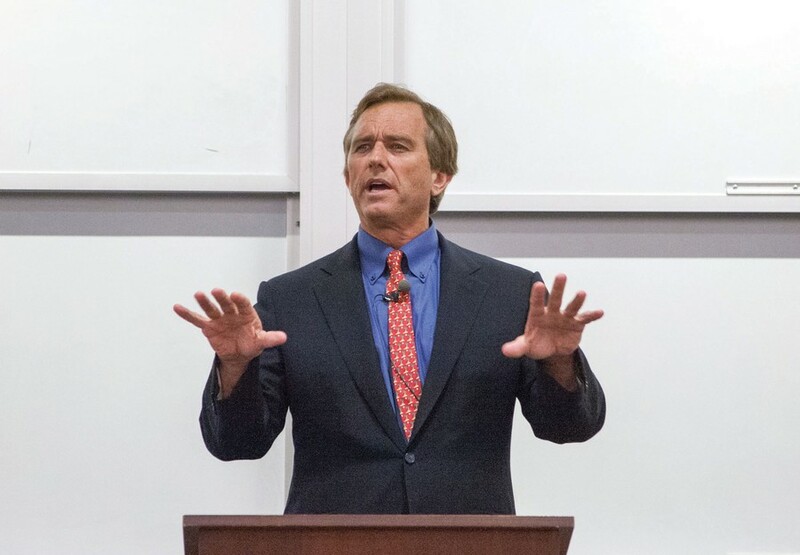 Robert Kennedy, Jr. addressed what he called the “biggest crisis we face as a civilization today”—the country’s reliance on fossil fuels—during a talk at the Law School on Thursday, stressing that environmental protection is necessary for, rather than at odds with, economic growth. Kennedy, an environmental law attorney and the nephew of President John F. Kennedy, said that free-market capitalism has been overtaken by special interests, preventing America from disposing of oil and coal in favor of cleaner-burning forms of power such as solar and wind. He went on to blame high-polluting energy interests, Fox News, and talk radio for the false presentation of the issue as one pitting the environment against the economy. Rather, he said, the two are complementary. Kennedy also said that the notion of “clean coal” is misleading, as coal-burning power plants emit the most mercury into the environment, endangering the food supply. Combined with the harmful health effects associated with coal emissions, like respiratory and cardiac problems, such environmental dangers cost $345 billion each year in healthcare costs and have exacted a toll on local economies. “There is no way that the economy can be regenerated,” he said, referring to areas of the country most affected by the extraction and burning of coal. In the large influence of the coal industry in Congress, Kennedy saw the uprooting of civil liberties as well. “Wherever you see the large-scale destruction of the environment, you see the destruction of democracy,” he said. Kennedy also scoffed at the notion that fossil fuels are cheaper than their alternatives—a perception reinforced by oil and coal subsidies. “There is an illusion that coal provides cheaper energy,” he said. In reality, he said, solar energy is cheaper than coal in 23 states. “If we had true free market capitalism, with no subsidies, coal and oil would die overnight,” he said, explaining that America must build a national grid system to streamline the flow of wind or solar energy around the country. “[The U.S.] can attract and utilize energy in a way that does not diminish our quality of life and get us into wars and diminish our leadership throughout the world,” he said.